Extreme weather events are causing suffering around the world. Multisolving solutions that target both climate change and flood risk can help. Last week, we heard news of massive floods causing untold damage and killing and displacing thousands of people around the world, in the southern United States, South Asia, West Africa, and Yemen. These conditions may have been exacerbated by climate change. In the US, climate change contributed up to 30 percent of Hurricane Harvey’s total rainfall, according to one climate scientist. That alone is enough reason to act on climate and prevent the worsening of such storms. But there’s more. If we mitigate climate change in such a way as to produce other benefits, we can do more than just keeping storms from getting worse. We can also soften the impact of such storms when they come our way. According to Bloomberg, the devastation to the city of Houston was partly attributable to poor city planning. So how do we do the opposite – invest in policies and plans that improve resilience to stormwater – rather than worsen it? It may help to look around the world to see how cities are building their resilience. In Singapore, rain gardens placed along a canal help with water runoff and reduce flood risk. 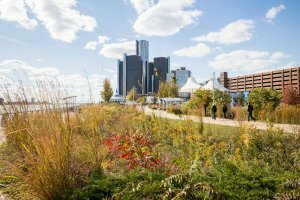 They also improve water quality, sequester carbon emissions, beautify the area, and give locals a place to gather and enjoy the scenery. In Copenhagen, parks are built in such a way as to turn into retention ponds when heavy rains occur. Park sculptures capture rainwater for later use, and the plants in the park help store water, mitigate pollution, and keep the air cool in the summer. This innovative solution is half the cost of laying out a new pipe system. In France, new commercial buildings must either contain a green roof or rooftop solar panels. 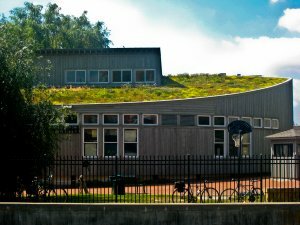 The green roofs absorb rainwater, passively moderate the temperature of the building, clean the air around them, and provide space for urban gardens. In the United States, efforts to restore coastal habitats such as mangroves, marshes, and reefs created buffers from extreme weather events and accelerated the alleviation of flood waters. The return on the restoration projects was $1.60 for every dollar spent, and the projects also created jobs and allowed the restored habitats to provide ecosystem services such as absorbing pollution. These diverse initiatives have a few things in common. Of course, they all mitigate floods. But they also reduce climate change by sequestering carbon emissions, thus treating both the symptoms and the disease. They even provide a range of other benefits, such as improving air and water quality, creating jobs, and saving energy and money. They also provide green space that people can use and enjoy. We call such initiatives multisolving – initiatives that both protect the climate and provide multiple benefits in one investment. 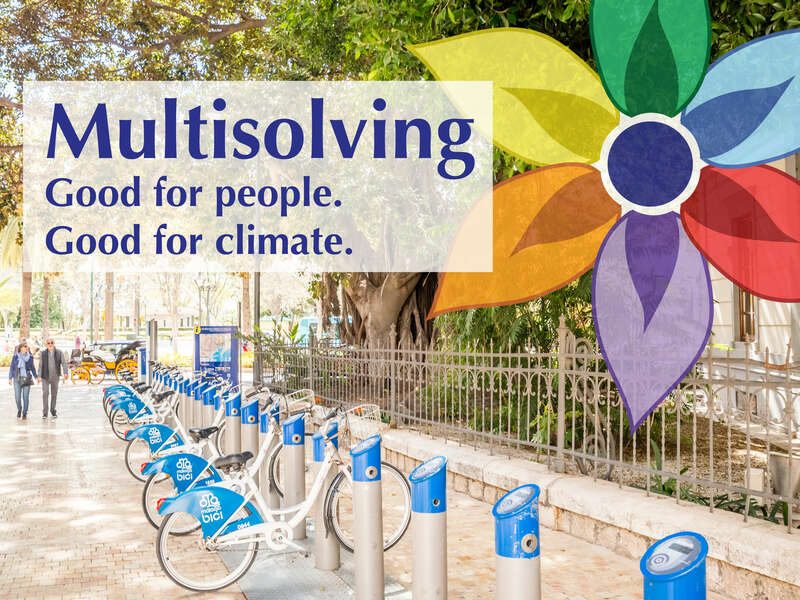 With devastating floods all over the world, wildfires in the western US and Canada, and Hurricane Irma bringing more extreme weather on the way, we need multisolving solutions more than ever. Follow our work to learn more.